Every year, we have a little Easter egg hunt with our neighbors. Last year, we invited a new family to the festivities, which added to the fun. This year, we’ve made even more friends in our neighborhood and a new family has moved onto our street. In the spirit of “the more, the merrier,” I think it would be fun to invite one and all to run amok in search of candy-filled eggs. 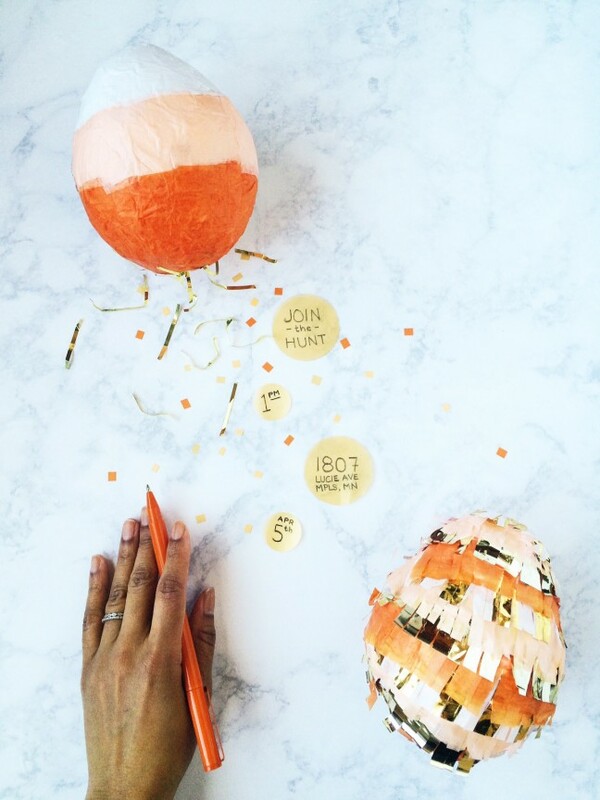 These DIY Easter egg hunt invite piñatas are the perfect way to invite neighbors to your yard. Since all of your recipients probably live in your neighborhood (or at least in your town) it’s no sweat to pop these little surprise eggs into each mailbox. Better yet, if the neighborhood children are at home, let your littles ring the bell and hand deliver each one. Step 1: Tear newspaper or copier paper into narrow strips. Tear each strip into sections about 3″ long. Set aside. 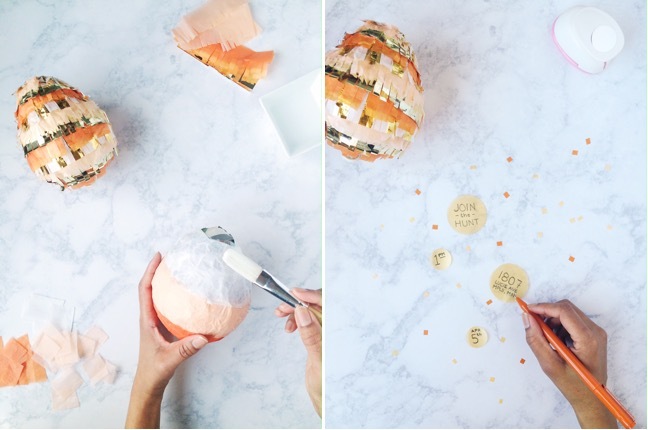 Cut tissue paper to apply to your balloon. Decoupage method: Cut square and rectangular strips of tissue paper of three colors to create an ombre effect. 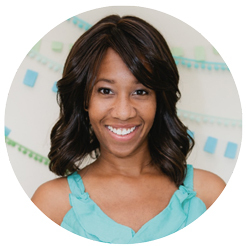 Fringe method: Cut 1.5″ strips of tissue paper, then cut 1″ long slits along the length of the strip to create fringe. Step 2: In a small bowl, create a 50/50 mixture of water and school glue. Use the paintbrush to stir the mixture until it reaches an even consistency. Step 3: Blow up a balloon only until it reaches an egg-like shape. If it becomes too round, simply let out some of the air to achieve the pointed shape at the top. Step 4: Using the paintbrush, coat the bottom section of the balloon with the glue/water mixture. Leave a small area around the balloon knot uncoated. While the glue is still wet, apply your tissue paper to the balloon in rows. Brush a thin coat of glue over the tissue once it’s been layered onto the balloon. Continue adding layers until your balloon is covered. Set aside to dry. Step 5: Create two 1″ circles using your scrapbook paper and craft punch. Punch two more circles using the 1.5″ punch. 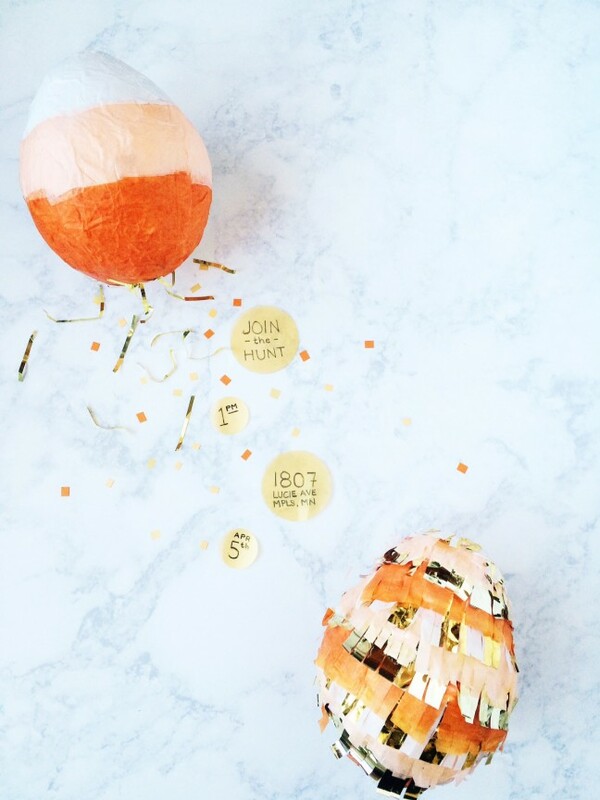 Write the date and time of your Easter egg hunt on the 1″ circles. 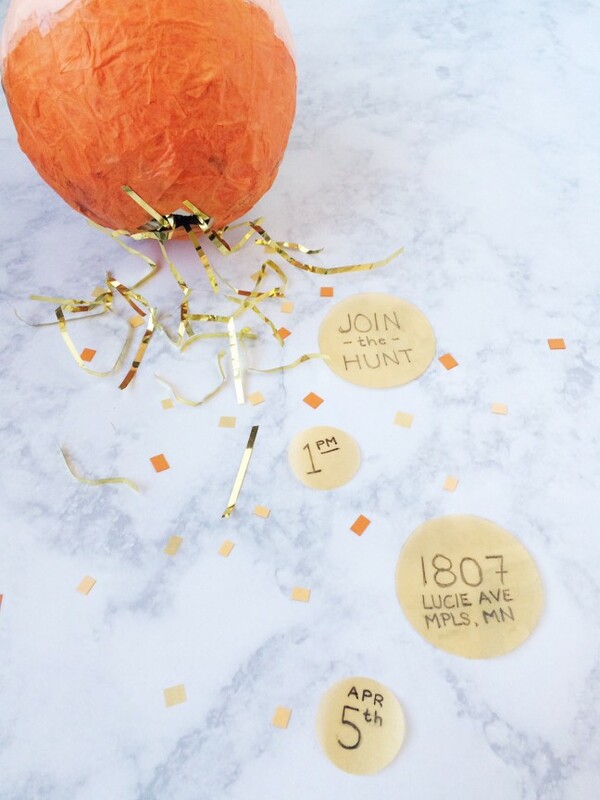 Write an invitation greeting, like “Join the Hunt,” on one of the 1.5″ circles and your address on the other. Allow ink/marker to dry, and write the same information on the back side of each circle. This way, the message is visible no matter which side the circle lands on when the piñata is smashed opened. Set aside. Step 6: Use a small pin to puncture the balloon. Hold onto the balloon knot as it deflates, and remove the balloon from the egg. 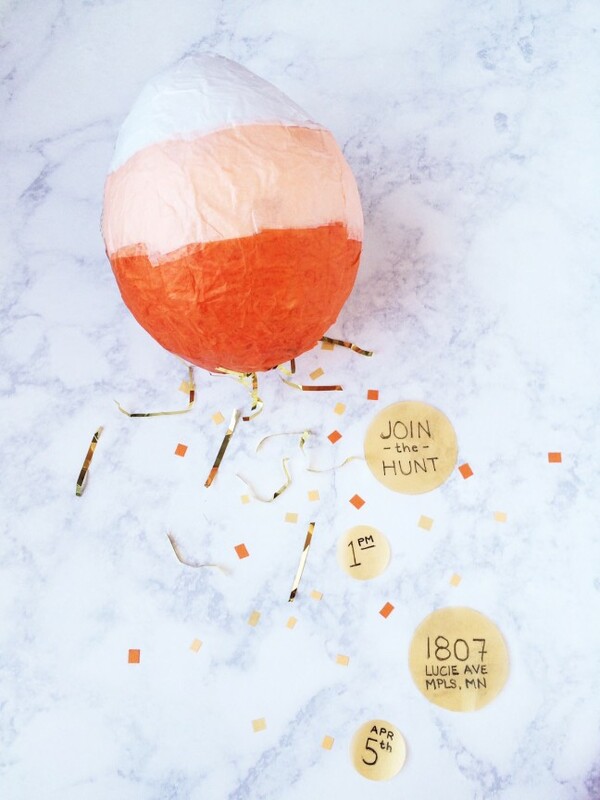 Fill the egg with crinkle paper, confetti, and the invitation-information circles. Glue a few layers of tissue paper over the hole to seal it shut.